I guess the word had gotten out that some of us Silly Hats were kind of crafty and the Walk Committee was wondering if we could come up with an inexpensive centerpiece for the Walk Kick Off Luncheon! We talked about ideas the next couple of weeks at our Tuesday breakfasts. In one of our shopping excursions a couple of us had seen some flowers made out of material that were pretty cute and decided to make something similar to that. We also decided we wanted to make them a little more personal. 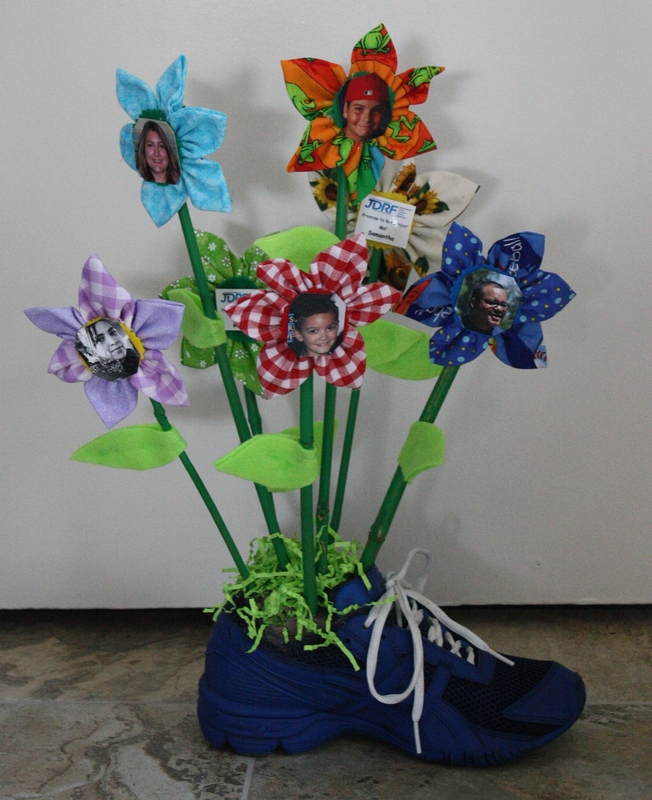 Since at JDRF their “Promise to Remember Me” campaign was in full swing and we are in the process of meeting with members of congress in hopes of putting faces to this crappy disease, we decided to put pictures of some of “our” adults and children living with Type 1 as the center of the flower! One of our walk sponsors is Ascics shoes and along with giving many pairs to walkers who earned a certain amount of money by a certain date, they had also given the chapter about 30 mis-matched tennis shoes. What a perfect vase!! Here in Orange County we have quite a few “JDRF Youth Ambassadors”, young kids with Type 1 Diabetes that volunteer to attended various public events, so we used pictures of them and our Children’s Congress kids…and I copied pictures of some of our adults from facebook and since “amazing race” winner and Type 1 Diabetic Nat Strand is also one of our own and our Celebrity Walk Chair this year..her face went on a flower as well! This awesome group of Silly Hats & Caps then divvied up the work to be done and we had our first project off and running! Arranged them all into 30 centerpieces and delivered them to the walk committee in plenty of time for the Kick Off Luncheon!